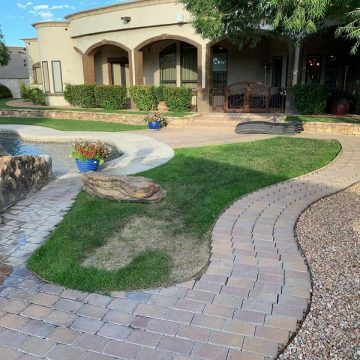 This week’s featured application comes to us from Turf Specialties, LLC in Albuquerque, New Mexico. 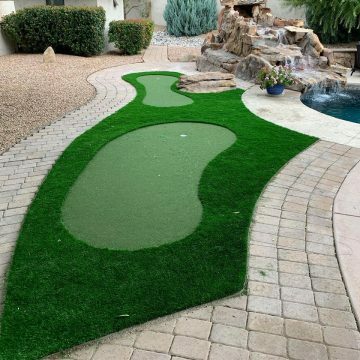 Turf Specialties has only been a part of the Synthetic Turf International network for a few years, but has surpassed every expectation. 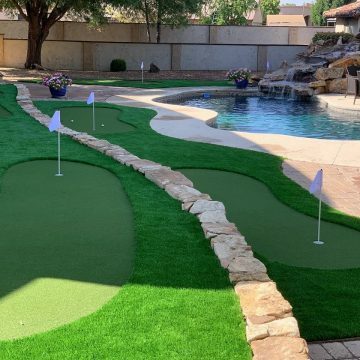 They are an extremely valued member of the Synthetic Turf International (STI) family, and they have an incredibly active social media presence. If you visit their Facebook page, you will see owner Marcus Molina in front of the camera giving updates on the install of many recent projects of theirs. 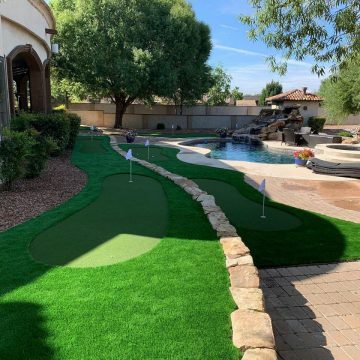 This latest install featured 4,000 square feet of turf, including a nine hole NP 45 putting green with a SoftLawn® Diamond Fescue fringe. 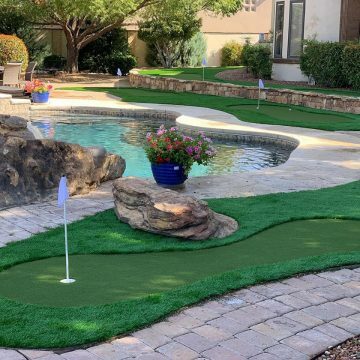 The homeowners wanted a nicer surface to complement their pool and pavers and decided synthetic turf would be the ideal surface. STI SoftLawn® Diamond Fescue is one of our mid-range options with a standard tan thatch. It has a 1 ¾ inch pile height and is made from a polyethylene yarn. Our SoftLawn® Diamond Fescue is a high-quality synthetic landscape style turf, typically used for landscape applications and is available in Field/Eastern and Eastern colors. Our NP45 is one of the best texturized nylon putting surfaces on the market. It is second only to its higher quality counterparts, NP50 and NP55. NP45 offers a natural roll and realistic speeds for an authentic putting experience. 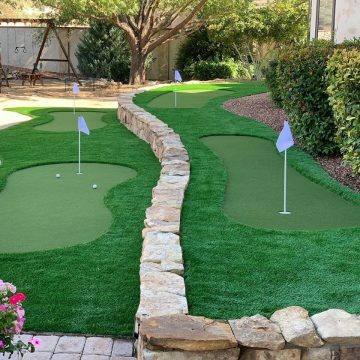 This turf performs best with the high-end ceramic infill offered by STI, but NP45 can also be used without infill, which makes it an ideal indoor/portable putting surface.